It's time to prioritize and reorganize with new filing. Tub files in contemporary steel mesh design hold letter-size file folders (not included). 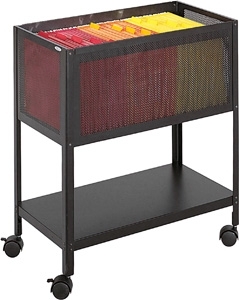 Perfect for the office, this filing system has a lower shelf for additional storage requirements. Available in two styles: the open Top, model 5350 or model 5351 file that includes a locking top that slides out of the way, two keys included. Mobile on four swivel casters (2 locking).